What Does Your Community Face? Vermont is defined by its natural landscape – the Green Mountains, the Connecticut River, Lake Champlain. These natural features are critical to both our identity and our economy. 7,100 miles of rivers and streams are found within the state, watercourses that were critical for travel and commerce when the region was settled by English and French colonists in the 18th century, as well as for the Abenaki communities that pre-date colonization. Our settlement patterns along rivers grew out of this history, and today many homes, businesses, and roads are at risk of flood damage, as Tropical Storm Irene made devastatingly clear. No town is immune. 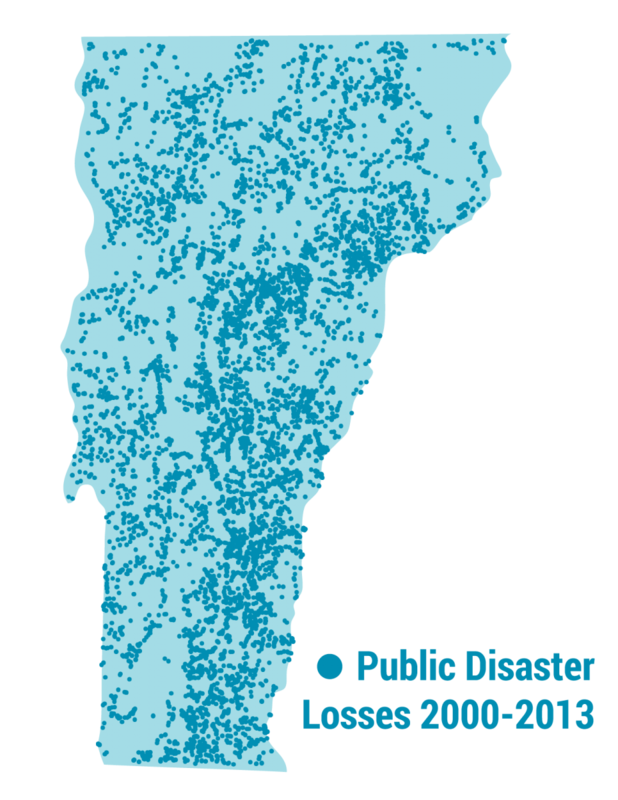 Between 1999 and 2013, 96% of Vermont towns requested assistance 531 times to repair roads, bridges, and buildings that floodwaters damaged. That added up to over $260 million or $19 million each year. And that doesn’t include private property damage. As our climate changes, these numbers will likely get worse, unless we build a better relationship with our rivers and streams. We need to make room for rivers, allowing them to overflow their banks when full and move within their River Corridor, finding the slowest way down the valley on a natural meander path. Controlling their path and reinforcing banks often leads to more powerful water and serious problems downstream. This training toolkit includes tangible steps your community can take to improve river management and flood resilience. As town officials, it is your responsibility to make sure your community is safe and your assets are protected in a way that doesn’t put others at risk. To do so, you’ll need to go beyond the minimum regulatory standards. The future of your community, as well as communities upstream and downstream, depends on local planning to have no adverse impact. Protecting what has already been built near a river while also ensuring that efforts don't put roads, bridges, businesses, and families downstream at greater risk. Following smart growth goals for compact development while also directing such development outside of a River Corridor or floodplain. Weighing the right of someone to develop their land if that development could increase risk for others. 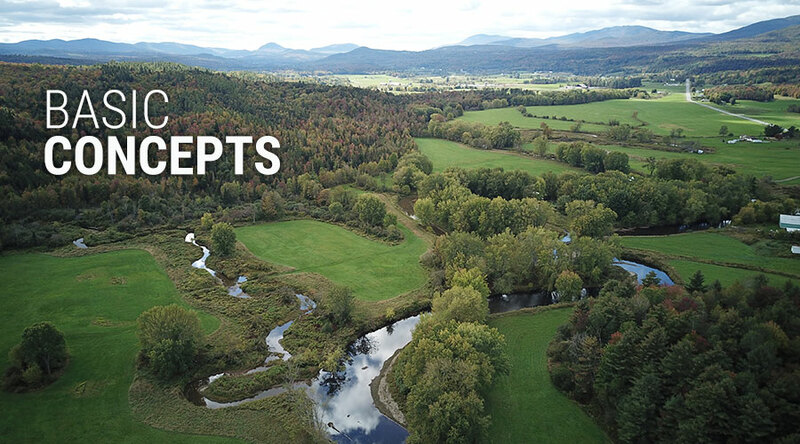 The Rivers Program of the Vermont Department of Environmental Conservation is here to help you as you navigate these challenges. As community leaders and municipal officials you need to start with understanding what your municipal regulations do, and don't do. You can visit the Flood Ready Atlas to visualize the mapped flood risks and River Corridors in your community. The Flood Ready Vermont has extensive information about hazards and planning including a page with definitions for river-related terms. Your Regional Floodplain Manager is available to answer your questions and discuss opportunities for your community. While this work can be daunting, we encourage you to boldly envision a future in which rivers have room to move and your community is safe and resilient. As Vermonters prepare for more frequent and intense storms as a result of climate change, simply meeting the minimum regulatory standards of floodplain management is not good enough anymore. It’s time to help your community safely weather the next storm. Would you like to print this content out and share it? Try this PDF. I had so many years of being surrounded by 3-4 feet of floodwater and now I’m surrounded by beautiful artwork and a community center and trails. This community does not have to live in fear of being devastated by these events. They’re going to occur, but as a result of the things we’re doing, we’ll be able to withstand them. Without living in fear of natural disasters and inability to survive them, a historic charming Vermont village can blossom in whatever way the community wishes it to. What is your community's history and relationship with your waterways? What do people already know about flooding? Who are the residents, organizations, and businesses likely to be interested in this work and how will you get them involved? What other community processes were successful in the last decade and how can you build from those successes? Who is your Regional Floodplain Manager and who at your Regional Planning Commission might work with you? Call them up and introduce yourself!